Numerous problems surface when you are arrested for DUI in Alabama. The consequences you face as the result of a drunk-driving can fall into several categories, including criminal, administrative, transportation, social, work, family, financial, and insurance—just to name a few. The two most immediate problems mentioned, however, are the criminal and administrative driver’s license suspension matters. All those who either are licensed in Alabama or drive on the public highways in the state have consented to submit to a chemical test of their blood alcohol content if they are legally arrested for DUI. Therefore, if a person who is arrested for DUI refuses to submit to a chemical test, he or she is subject to a driver’s license penalty. In addition, those who submit to the blood alcohol test and test over the legal limit may also lose their driving privileges. Any administrative driver’s license penalty meted out is separate and distinct from a criminal driver license suspension and or revocation. The proceeding is civil in nature, not criminal. The length of the administrative driver’s license suspension is determined by how many “alcohol or drug-related enforcement contacts” a person has in the preceding five-year period. These contacts are deemed to be: any previous administrative suspension in Alabama, any administrative suspension from Alabama or other state for refusal to submit to test, or any conviction for DUI (alcohol or drugs) in Alabama or another state. However, only one contact may be considered from each DUI case. For no prior contact, the suspension period is 90 days. One prior contact causes a one-year suspension. Two or three contacts will result in a three-year suspension, while four or more can lead to a five-year suspension. Contacts are only counted if they occurred within the last five years. There is a process by which you can challenge an intended administrative suspension. If you refuse the blood alcohol test and or test over the legal limit, the officer will take your driver’s license (if you are licensed at the time) and issue you an AST-60 (yellow) form. This form is your temporary driving permit for 45 days from the date of your arrest. During these 45 days you have several statutory remedies you can exhaust to protest and challenge the administrative suspension of your license. First, you must make a written demand to the Alabama Department of Public Safety to review the intended suspension of your license. This should be done immediately within 10 days of your arrest. If the Department of Public Safety finds the suspension to be adequate, you are entitled to an administrative hearing. If you lose the hearing, you are entitled to judicial review. When you are arrested for DUI, you are facing severe penalties in a criminal court of law. Even for first-time offenders, there is a potential jail sentence of up to one year; with fourth or subsequent offenders facing prison sentences ranging from one to ten years. Fines can range from $600 to $10,100, depending on how many times you have been convicted. Criminally, your license can be suspended and or revoked from 90 days up to five years, depending on previous DUI convictions. 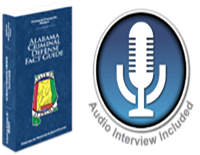 As you can probably assume from the information stated above, being arrested for DUI in Alabama triggers endless court proceedings and other problems. That’s why it is important to contact the right lawyer to guide you through these murky waters, as there are ways to WIN your DUI case and SAVE your driver’s license. Contact us today for an aggressive DUI defense.